with Snowmass Peak in the background. 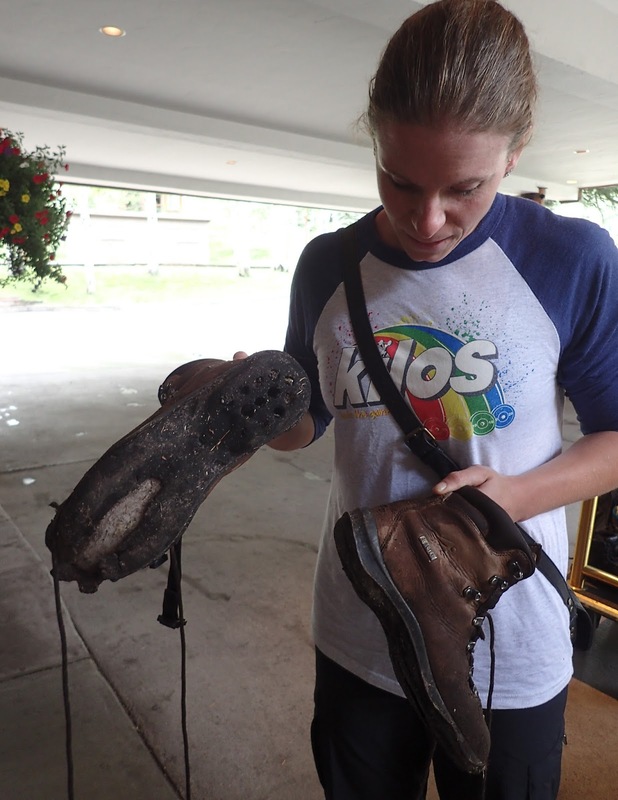 As I drifted off to sleep on the first night, I wondered if I'd made a rookie mistake bringing old boots on a hike. Before we turned in, we made some decisions. Instead of attempting Snowmass Mountain, we'd see how my boot did on hikes around the lake and see if the other boot stayed in one piece. We'd chat with a folks camped near us who planned to climb the mountain about conditions and double check the weather forecast. Then, we'd either hike out the third morning, or give the summit a go and stay an extra night. Turns out, it wasn't such a bad alternative. After surviving an incredibly loud, slightly terrifying thunderstorm on the first night, (I swear lightening struck one of the mountains right next to us), we started our morning with copious amounts of Starbucks Via and Mountain House eggs and bacon. We packed up snacks and water, closed up the tent, and picked up a social trail heading around the east side of the lake. I had a feeling there was a pool worth investigating and wanted to get a view of our camp from a new perspective. Beautiful beyond words, no? Dan, who's 6'0" tall, looks so teeny against the giant mountains and the lake! 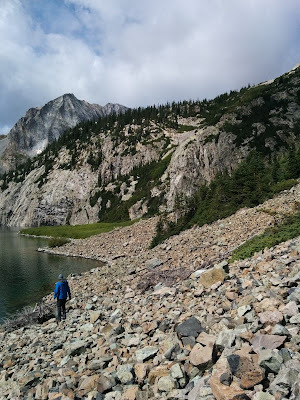 The social trail rounded the eastern end of the lake next to a rocky beach, traversed a talus slope, and dropped us right on top of a rocky peninsula separating a deep emerald pool from the lake. 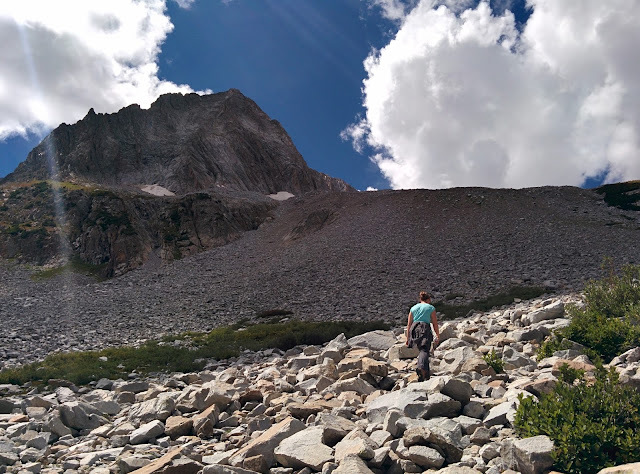 We made our way as far up the talus and scree at the end of the pool as we were comfortable, snacked near the lake, and kicked ourselves for not having packrafts. 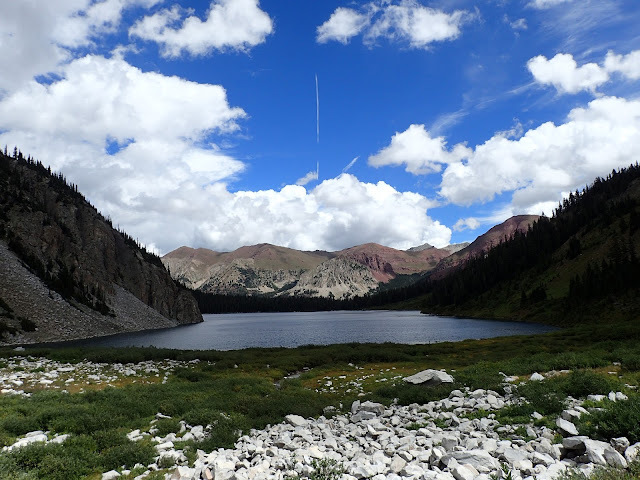 After we'd had our fill of the east end of the lake, we retraced our steps back to camp and picked up the trail we'd use if we decided to attempt Snowmass Mountain. At that point, a summit attempt was looking less and less likely. The weather forecast called for a storm the next day and my boot was holding up, but the webbing I'd used to tie the sole on was showing signs of wear. The last thing I wanted to deal with was the sole falling completely off at 14,000' and having to descend a giant screen slope with one working boot. And what if the other boot started to go too? We had a small reserve of duct tape if the webbing failed, but it wasn't enough to completely wrap up both boots. Looking back at the lake from the base of Snowmass Mountain. So many colors! 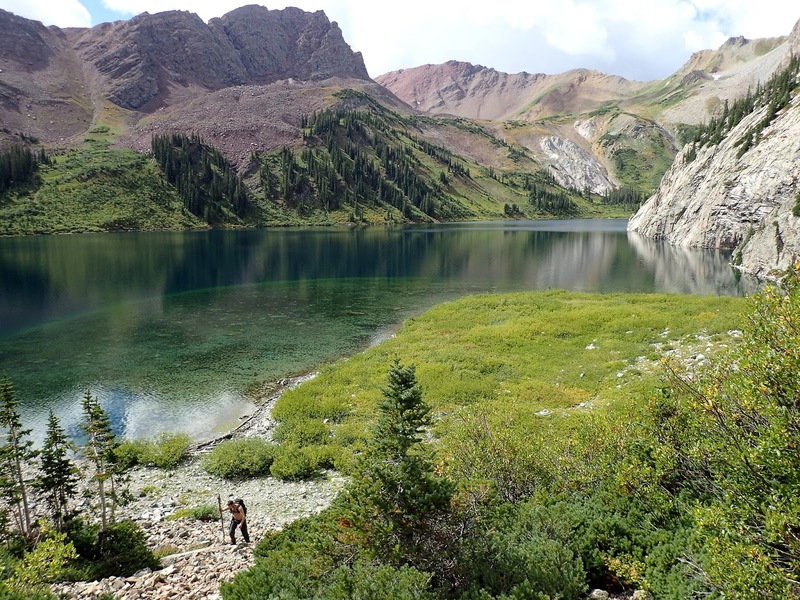 We crossed Snowmass Creek, passed a few more beautiful campsites, and headed around the southern side of Snowmass Lake. It quickly became obvious that the start of trail to the summit was a rough one from the get-go. We pushed through thick stands of willow bushes for a mile before the terrain opened up on to a giant boulder field at the base of Snowmass Peak. We climbed halfway up the boulder field, listening to rushing water below us as points, before turning around. I wanted nothing more than to give the summit a go, and was disappointed it didn't appear to be in the cards for us on this trip. After descending back into the willows and walking back to camp, we decided we'd hike out the next morning and visit nearby Crater Lake. (Technically, we could've walked there via Buckskin Pass, and maybe we will someday.) I could've stayed at Snowmass Lake for weeks, but was also itching to see more new terrain. I read Jennifer Pharr-Davis's Becoming Odyssa cover to cover before turning in, thinking if I'd carried the book all the way to the lake, I'd better finish it. Making my way up the beginning of the trail up Snowmass Mountain. It took everything I had not to just keep going! We woke to cloudy skies on the third morning and knew we'd made the right choice to hike out. Unfortunately, by the time we packed up left camp, it started to rain. 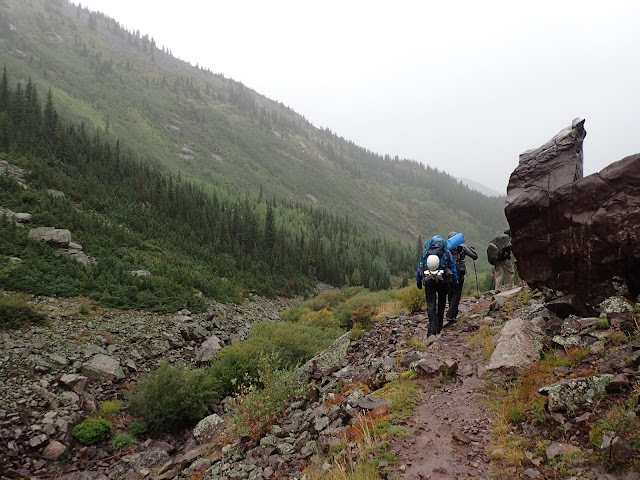 The rain was light at first, but as we ventured off the spur trail from Snowmass Lake and on to the Maroon Snowmass Trail, it started to pour. And, (spoiler alert), it didn't stop until we got to the car four hours later. As we navigated down the switchbacks and toward the meadow, I paid careful attention to the conditions of my boots. My partner and I got separated for a bit while he stopped to put on his rain jacket. Fortunately, we found each other again, but the rain continued to fall. Completely and entirely soaked on the way out. But we made a new friend, and good conversation always makes rainy hikes more fun! Crossing the log jam in the rain took a lot more focus than it had in good weather on the hike in, but we made it and continued down the trail. 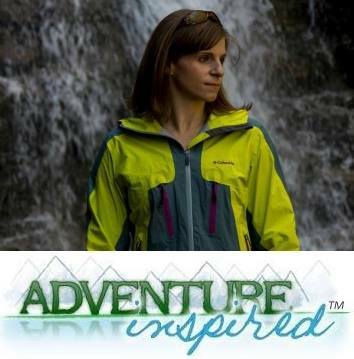 At one point, I stopped to put on another layer underneath my rain jacket. While I was getting situated, my partner said, "I hate to be the bearer of bad news, but it looks like the sole on your right boot is going too." I looked down, saw he was right, and couldn't help but be at least a little bit glad I wasn't dealing with continuing footwear malfunctions on a 14,000 foot peak. and I'm sad to see them go. Eventually, as we dropped down into the stands of aspen, the right sole completely detached from the boot. The left sole followed suit shortly after, despite the webbing holding strong. At this point, I was, for all intents and purposes, hiking in moccasins, but was surprisingly not having too much trouble dealing with the terrain. Eventually, when you're wet and still have miles to cover, you accept the discomfort and don't let it bother you! I also had to laugh about how silly I looked with sole-less boots on a hike like that. I strapped the detached soles to my backpack as we pressed on. My feet were completely soaked from the rain and sloshing through ankle-deep puddles, but I knew once we made it back to the car, I had dry clothes and dry shoes waiting for me (the BeastWorx shirt in the photo on the left is the most comfortable shirt ever). I hopped in and out of giant pools of water on the trail until we passed through the three gates again and found ourselves back at the parking lot. There were parts of the trip I don't care to repeat, like the part where I didn't have adequate footwear, but in general, I had an amazing time backpacking to and from Snowmass Lake. The scenery is other-worldly and the time we had to explore around the lake was incredibly rewarding. You can bet I'm going back to climb that mountain someday, though! Have you ever had footwear malfunctions on a trip? Hiked nearly nine miles in the rain? How do you deal with rain when you're hiking?